If you have an electric vehicle, you are going to want to have a residential electric car charging station. This home car charging station needs a correct installation for your safety and the safety and efficiency of your electric vehicle. Gilbert AZ area local codes may require permits and inspections for your Gilbert residential electric car charging station installation. An electrician can run from a little bit to dozens of feet of conduit to accommodate your parking location and desired Gilbert residential electric car charging station location. This does add to the installation costs; however, you’ll want the convenience of being able to charge your electric vehicle easily since you’ll most likely charge it each night. Electric vehicle charging stations are not everywhere in the Gilbert Az area like gas stations, but they continue to grow in number with more locations as electric cars continue to gain in popularity. 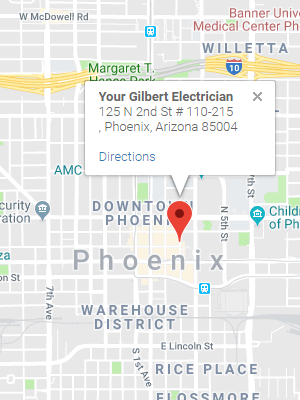 It is a wise decision to have an electrician run a dedicated circuit for your Gilbert residential electric car charging station. Once you’ve driven home an electric vehicle, it can make your life a lot more convenient to have a residential electric car charging station at home. This will enable you to be able to fully charge an electric vehicle in less than a day which you can’t do with a standard electrical outlet. Our licensed electrician will install the residential electric car charging station to conform to all National Electrical Code and Gilbert Az area local code and permit requirements. If you own an electric vehicle and you’d like the efficiency, convenience and safety of charging your electric vehicle at home, contact us for installation services of a dedicated 240 Volt Level 2 charging station. Our qualified electricians provide professional installation of residential electric car charging stations throughout the Gilbert Az area.